An Ancient Solar System...: The Universe in 101 words: How does a lightsail drive work? The Universe in 101 words: How does a lightsail drive work? Are you looking for a gift with a difference? How about art by a mad scientist? Find the original acrylics here on Etsy. Or find prints, from $14, here on Society6. 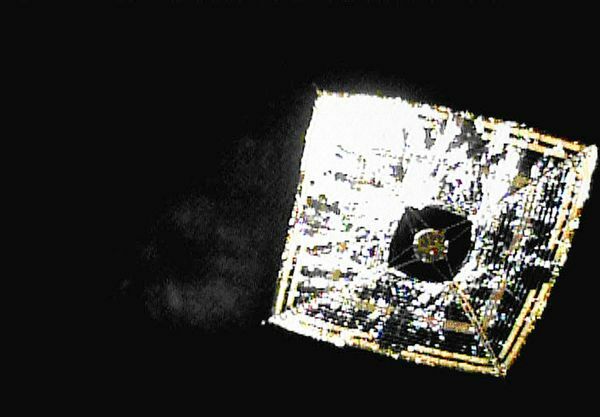 Above: Japan's IKAROS light sail spacecraft, photographed by one of the tiny survey satellites released from it after the sail deployed. You can’t feel it, but light exerts a push on anything it reflects from - so tiny that, on Earth, it's overwhelmed by even the slightest breeze. Not so in space: A spaceship can catch sunlight's push using a large reflective sail. Although slow to accelerate*, eventually it can build immense speeds - probes like JAXA's IKAROS use them today. *So Jeremy Clarkson would not approve, but balls to him. You've read our science facts - have you tried our science fiction? You can pick up our book on Kindle, or as a paperback, by following this link. 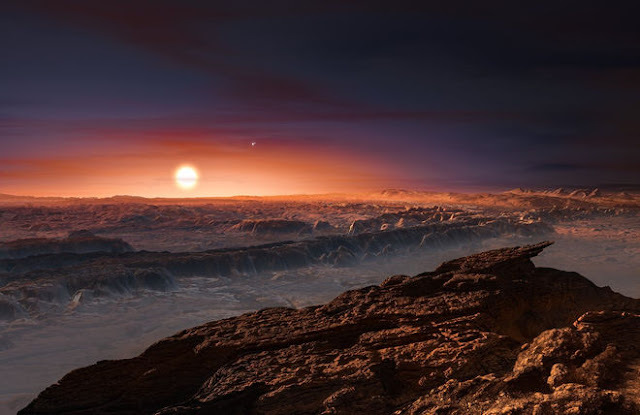 Above A artists impression of sunset over Proxima Centauri B, the nearest exoplanet to Earth. The Universe in 101 words: Storms on Titan? The Universe in 101 words: Does it snow on Mars?